There’s been much discussion in the yoga community about Accessible Yoga. The word “accessible” can mean many different things, based on your lens. The Accessible Yoga Mission Statement begins with “Accessible Yoga is dedicated to sharing the benefits of Yoga with anyone who currently does not have access to these practices, and with communities that have been excluded or underserved.” This leaves it open for yoga teachers to focus on areas they are called to explore. My path has been to make the practice of yoga accessible to those with physical and/or cognitive differences through Adaptive Yoga. 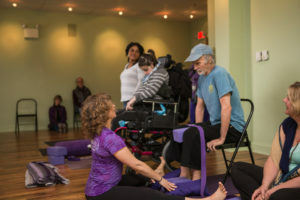 Since our introduction of our Adaptive Yoga Program at Yoga Home in January 2016, our program has served hundreds of individuals with varying abilities. With the belief that yoga is for EVERY body, we’ve customized yoga classes for adults and children in out studio, at residential and day programs and in schools. We’ve trained over 250 yoga teachers, educators, physical and occupational therapists, nurses and aides to empower them use yoga as a healing tool. There are universal principles in the poses and in each body. The more you emphasize these, the more commonality you build. Poses will look different in every body. Explore in your own body and teach the underlying inner body experience. Breaking down poses and teaching individual parts makes it more accessible for all. Acknowledge students’ needs and compensations. Rather than ‘fixing’ a pose, seek enlightenment of how the pose manifests in their bodies. There is a difference between adapting yoga and adaptive yoga poses. Teach the experience of the pose, not just the physical posture (asana). Plan on using more props than you ever thought possible. Blocks, bolsters, blankets, straps and sandbags create a safe and stable container as well as being tools for expansion. Explore the postures with you students to see what works for them. 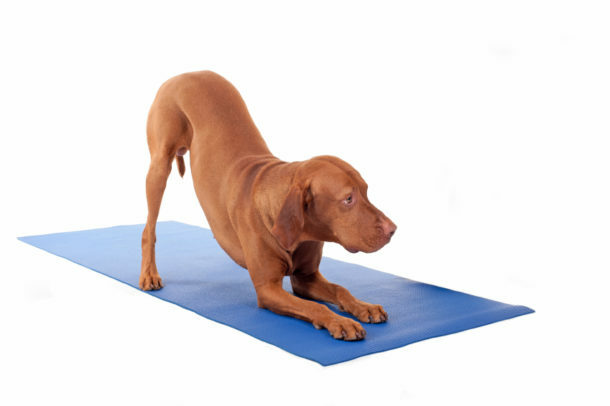 Downward Facing Dog can be done standing or seated; use a chair, wall or partner for support. (Click link in bio to see 5 Variations of Downward Facing Dog). Every one of our students has asked for more breath work. Many of our students have diminished lung capacity, physical limitations that impact their ability to breathe deeply or chronic health issues that make deep breathing a challenge. Giving space in a class to deepen the breath, in whatever form is possible, is essential. It facilitates a deeper mind-body connection and allows the student to become more aware of sensation. Using appropriate and supportive language is essential. Let your students be yogis, not their labels –Focus on your students stepping into their bodies as yogis, not a patient. Let them set aside their disability, chronic pain or illness so they can become the yogis they’re meant to be. Focus on ABILITY, not disability – Phrases such as “To the best of your ability”, “if meaningful for you”, “if it serves you” will serve you and your students. Use Person centered language – Focus on the individual, not the disability. Think “student who use a wheelchair for mobility”, not “wheelchair student”. As with any yoga practice, the opportunity for a student to experience the mind-body-spirit connection is everything. In Adaptive Yoga practices, we slow down and strive for awareness of sensation. The pauses between the postures are just as important as the postures themselves. Our Adaptive Yoga students are some of the most fiercely committed and loyal students I’ve had the pleasure of knowing. Helping them access the practice is a privilege. Kerri Hanlon is co-founder and creator of the Adaptive Yoga Program at Yoga Home in Conshohocken, a Best of Philly Yoga Studio. She is a contributor to CBSPhilly and shares her experiences about living with and grieving a child with disabilities so others know they’re not alone. Her practices are available through Yoga Home’s online studio.